INCREDIBLE!!! Ally’s Angels met our team goal of over $2000!!!! Thank you sooooo much to those who have donated this walk and/or previous walks and charities that help Ally. Having a daughter with a chronic disease of Spinal Muscular Atrophy is not easy, but one positive is her spirit and another is seeing the kindness in others (even strangers). I need to give a HUGE THANKS to EVERYONE, but especially the family and friends of our nurse Tina Chiang!!! I believe almost half of our team’s donations have come from them and they’ve never even met Ally. WOW!!!! It means a TON to having such caring friends, family, and strangers (considered new friends)!!! One week and one day till the MDA Muscle Walk at Soldier Field on April 5th. Anyone else willing to join us at the walk or make a donation in honor of Ally? Every $dollar REALLY does make a difference! Help us cross the Muscle Walk finish line and FINISH STRONG! Join us at the Muscle Walk on Saturday, April 5th at Soldier Field (Walk begins at 10am, registration and fun begin at 7:30am) and we’ll have a great time for a great cause. Better yet, make a donation today, and help me reach my fundraising goal to help support the families who depend on MDA. Together, we grow stronger. As many family members and friends know, Ally has type 1 Spinal Muscular Atrophy Type 1, one of the 43 disorders covered by the MDA. This is a genetic disease that Billy and I (Tina) carry the recessive gene for (actually 1 in 40 people carry in the gene). SMA affects ALL the muscles of the body which is why she unable to walk, talk, move most of her body and needs assistance for breathing. Although Ally has soooo many odds stacked against her, what is VERY IMPORTANT to remember is that she is a HAPPY little/big girl who’s heart and brain are unaffected. Each day, we try to give her the BEST life possible and surround her by love, friendship and amazing experiences. 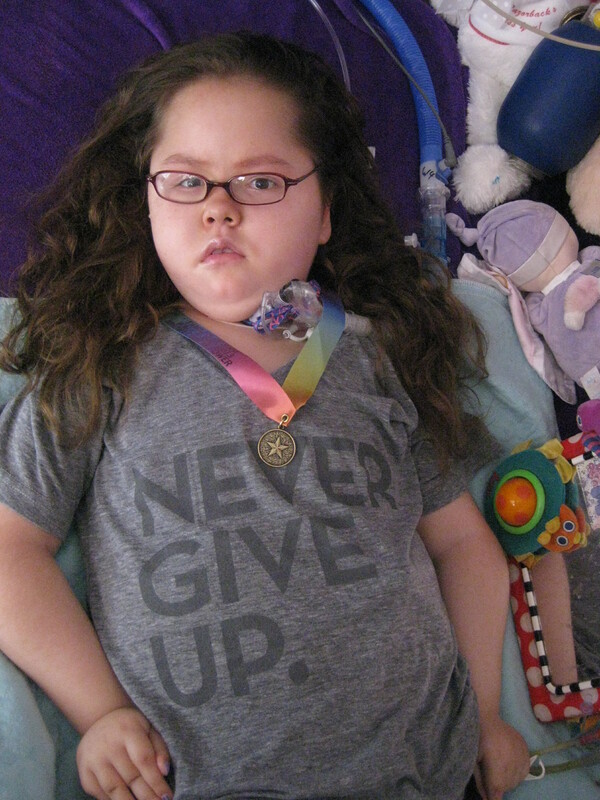 Ally has taught those around her the true meaning of life, love, friendship, courage, faith… She continues to beat the odds and turned EIGHT years old on February 2, 2014 when medical books gave her a life expectancy of less than 2 years old. 1) MDA helped pay for some of the medical costs associated with the clinical trial for hydroxyurea that Ally participated in for over 2 years travelling back and forth to CA. She is still on this drug today and it is not a cure, but does increase some movement in her body (especially her hands, which she is now using to drive her own power wheelchair). 3) MDA gives $500 each year to repair/upgrade medical and adaptive equipment. 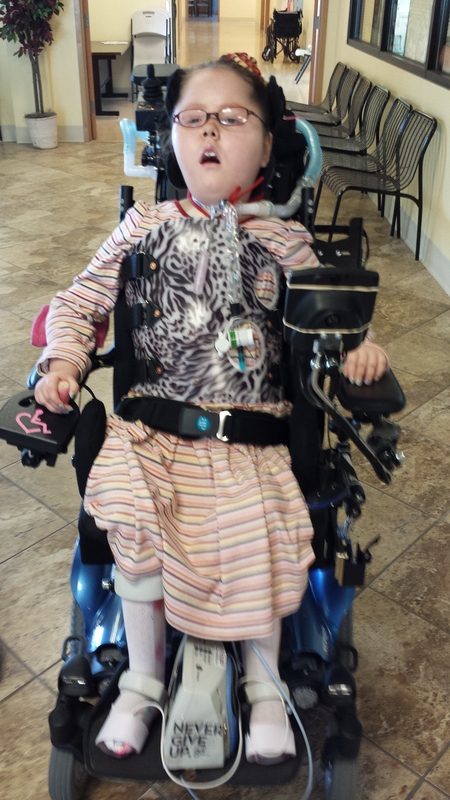 We were able to get Ally a size 2 seat for her indoor seat by using a combo of 2011 and 2012′s funds. AGAIN, please remember that every $1, $5, $10 or more REALLY does make a difference!!! Please donate RIGHT NOW as the walk is approaching VERY quickly on April 5th!!! If anyone would like to join our Ally’s Angels team, please contact Tina at tina@angelally.com or 773-283-7211. This year it will be a semi-indoor walk at Soldier Field with the walk beginning at 10 am (registration and fun begins at 7:30 am).